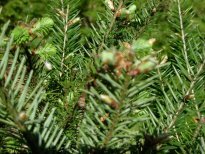 Naturally the Douglas Fir remains one of the most popular Christmas Trees available. The needles are dark green 1 to 1 1/2 inches long and are soft to the touch. Douglas Firs are normally sheared and produce a crop within 7 to 10 years. 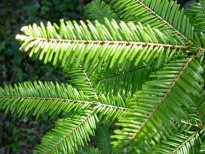 The Grand Fir has needles 1 to 1 1/2 inches in length with glossy dark green tops, in a flattened, horizontal pattern. They are quite distinct from a Douglas Fir. 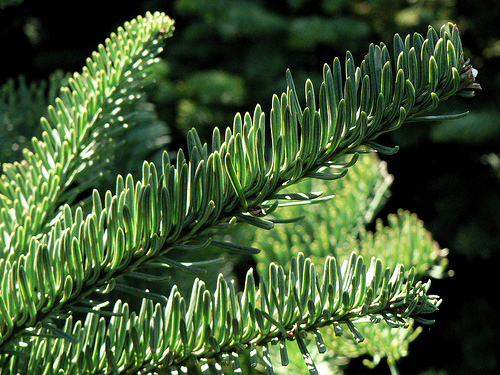 The Grand Fir is one of the tallest firs, reaching heights up to 300 feet. The needles are roughly 4 sided, over 1 inch long and are bluish green. It has stiff branches and is growing in popularity. The RAF Mosquito planes of World War II were built with Noble Fir Frames.